Analyse at least two dramatic monologues and explore how the poet creates a realistic and shocking 'voice'. 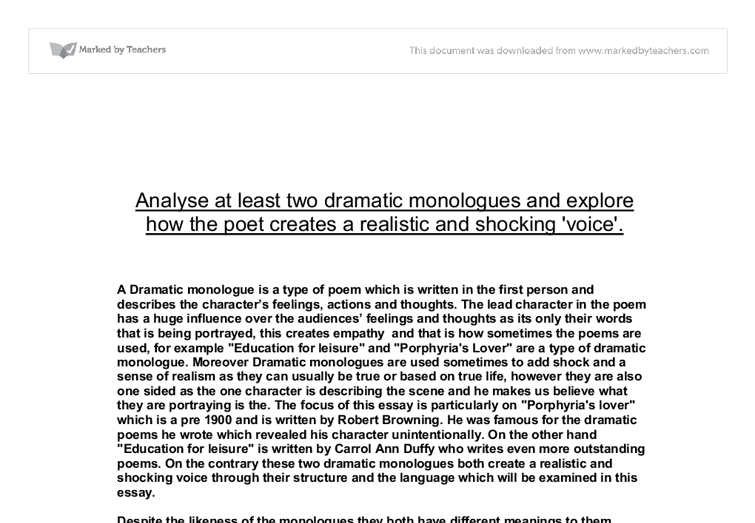 Analyse at least two dramatic monologues and explore how the poet creates a realistic and shocking 'voice'. A Dramatic monologue is a type of poem which is written in the first person and describes the character's feelings, actions and thoughts. The lead character in the poem has a huge influence over the audiences' feelings and thoughts as its only their words that is being portrayed, this creates empathy and that is how sometimes the poems are used, for example "Education for leisure" and "Porphyria's Lover" are a type of dramatic monologue. Moreover Dramatic monologues are used sometimes to add shock and a sense of realism as they can usually be true or based on true life, however they are also one sided as the one character is describing the scene and he makes us believe what they are portraying is the. The focus of this essay is particularly on "Porphyria's lover" which is a pre 1900 and is written by Robert Browning. He was famous for the dramatic poems he wrote which revealed his character unintentionally. On the other hand "Education for leisure" is written by Carrol Ann Duffy who writes even more outstanding poems. 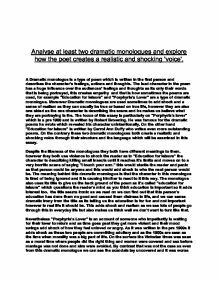 On the contrary these two dramatic monologues both create a realistic and shocking voice through their structure and the language which will be examined in this essay. ...read more. When he commits the murder he replies "no pain felt she" here we can tell the murderer is trying to take away the negativity and has a guilty conscious as he replies again "I am quite sure she felt no pain." By repeating himself he is trying to reassure himself it was right and that se had not felt anything as he wants to make sure as there might be some kind of love still deep within that he feels for her. "Education for leisure" however uses a very different type of language compared to the other monologue. The opening sentence is very dramatic and adds shock to the reader as it states " today I am going to kill something." it shows us the aggression and straight away that the person in this monologue is disturbed or furious with something. The sentence is short which attracts attention and is very successful in telling us what the dramatic monologue is about. In the last stanza the writer describes "there's nothing left to kill" this shocks the audience outrageously of how it is easy for this person to talk about killing like they have no heart. We start to wonder how he/she means there's nothing left to kill, this disturbs us as does that mean he/she has killed everything else around them. ...read more. In the end he says "I touch your arm". The ways the tension is built in this monologue is very effective as by the end it leaves you in a cliff hanger as whom that person is and the fact that it actually could be you as the reader so it involves the audience too, This really attracted my attention. "Porphyria's Lover" was not even a text of it's time therefore it could not relate to its audience very well. However "Education for leisure uses simple word choices but gets to the point very quickly and effectively. It uses sentence structure to make it more effective. Using short sentences and long sentences adds effect as it grabs the audiences' attention and gets the pulse increasing and the heart beating faster. the way the events happened it became more threatening like a real life story, but also there are new everywhere day by day of what people go through like this person did so it makes us understand more how this person feels and creates even more realism, but also the most effective threatening voice as this kind of murder is not rare but happens. As a result I could relate to this monologue better and found it more effective. Some of the techniques I described were used to add shock and realism to these monologues. By: Elnaz Eghtedar ...read more. This student written piece of work is one of many that can be found in our GCSE Comparisons section. He attempts to bring the whole scene to life. The word "Crunch" has an impact on the reader as it involves and helps them imagine they are walking with him. Furthermore, this gives the reader an idea of construction, wasteland and neglect. The hard accentuation of the "D" is ringing through these opening lines; the "D" is also referring to the idea of death, which this poem is revolving around. "A vulture perching high on broken bone of a dead tree". The poet has personified the tree by giving it bones. old man gives a sudden reaction towards the Narrator to make him feel threatened, also his jerky movements seems like he has no control over his body, 'The old man with the cough jerked his head back so suddenly that it startled me', this is properly he heard something that made him jump or frightened him. This gives us the impression of hard manual labour because they have just had their lunch hour and it is now time for them to burn off their fat. We know they carry out hard physical work because the poet has described this, "the wheels within wheels unlocked again, pulling rough boards into the plane's pneumatic grip". The words 'in coop and comb, the fleece of his foam, Flutes and low to the lakes fall home'. These words may be trying to create sounds like the movement of the water by the use of the word 'flutes'. He finds the prejudice of society when he was arrested for terrorism in 1987 and was banned for publicly speaking for 5 years, however he carried on writing despite the ban and he wrote "Nothing's Changed" under his new ANC name in 1970. This poem is more wise then Walker's "The Lie" and is not so emotionally involved. When looking at the mood of the poems, we can see that both of the poems have a bitter sad mood, but "never offer your heart to someone who eats hearts" has a more frightening mood. The romantic theme carries on, though giving some awkward impressions using a difficult choice of vocabulary. Unfortunately, the poem concludes with the death of his wife, and a sense of unhappiness stands out by the constant use of negative language.